The Sidchrome Imp was New Zealand's most famous Imp; Jim Richards, one of N.Z. most successful drivers. 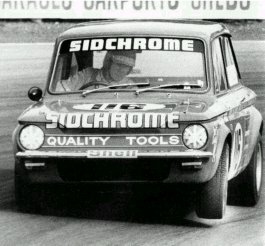 Sidchrome sponsored several Australian and New Zealand racing drivers in the 1970s, Jim Richards (New Zealand and Australian saloon champion) was the most notable. Mini's were abundant, but also in evidence were the two Hillman Imps of Roy Harrington and Jim (Jimmy, at the time) Richards. The Harrington Imp was painted bright yellow and the Richards one was painted in the sponsors colours of red and yellow - this being Sidchrome. The Imps were as fast as the Minis, but usually suffered from mechanical problems and seldom ever won races, much to the disappointment of the crowd, who loved the underdog. Patrick Imp ? Brian Patrick built it. Jim Richards later drove a Mustang. He is currently (1998) a works driver for Volvo in the Australian Super Touring Championship. The Sidchrome Imp was bought in 1988 by Tony Mann. He is restoring it. :-) Over the summer of 1998 he spent many hours on the project. The car is getting a roll cage fitted and will be finished end of September. Then comes the painting and signwritting. It will be painted back to its original appearance as of '72 (yellow top with red bottom with the sidchrome spanners and the sidchrome man on bonnet). In New Zealand Imps never overcame the unreliable image that came with a faulty car released too soon to the market. With the exception of Jim Richards in the Sidchrome Imp the cars never enjoyed the recognition on the track or in rallies as they did in the UK. In New Zealand Jim Richards had a successful spell in the Sidchrome Imp - this car is alive and well in Dunedin. In 2006 in the Dunedin Street Race he drove Tony Mann's immaculately restored Sidchrome Imp. The Jim Richards Story / by Barry Naismith. - Glen Waverley, Vic. : Garry Sparkle, 1986. - 96 p. : ill. (some col.), ports. ; 31 cm. POS. CAR  DRIVER               MAKE-OF-CAR          LAPS   ELAPSED  BEST-LAP   DIFF.